LovePrints. USA Football. Love, one play, one rep, at a time. A Saturday morning in San Antonio, Texas. Hundreds of young athletes, hundreds of parents, and a few dozen coaches, all giving up a weekend morning for something or someone they love. All connected by a game, all connected by ambition, and all connected by the colors. Red, white, and blue. All for the game we love. Football. USA Football. The young people love the game so much that they gave up a free weekend to give themselves a chance to be better at it. They put down their cell phones, disconnected from social media, and they turned off their televisions for a chance to participate in a game that adds character, strength, inclusion, and love. Love of self, others, and something bigger than themselves. Love of a game that can take them places they have never even dreamed of. For colors that when at their best, loves them back. The young people trusted the process, engaged with their new brothers, competed at a higher level, and gave themselves a mirror to measure themselves in. They were joined by parents who work hard to provide these opportunities, provide the gear to train in, the transportation and meals, plus the encouragement needed. These parents sit in the Texas sun, strain their eyes searching for their young ones, and cheer like crazy before, during, and after the plays are made. And, when they are not made. The coaches give up time from their own families to add to, help with, and teach these young people. They love the game enough to add to its possibilities, and to pass on their knowledge to others. These coaches understand that the game deserves love, respect, and a showcase, so they provide it all in their own individual and collective labors of love. 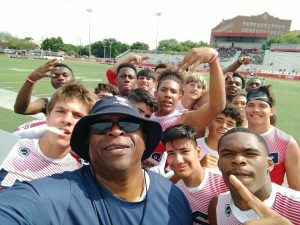 USA Football has done an exceptional job in organizing these camps and games. They have included international development deals with other countries, who have all embraced this American game and added their own love to it. From all parts of the USA, families choose to find and make time to include themselves in this game, this process, this adventure. Many college and NFL players have come through this program, and have shown that when the stars and stripes are earned, they are worn with pride and honor. Earn your stars is more than football. It is a wonderful bit of direction, a call to arms, and a celebration of who we are, and who we want to be. I love looking in the eyes of these young football players. That glow, that sparkle in their eyes come from deep down within them. It is about the country, the game, and themselves. They know that the honor can't be given, it must be earned. When you earn your stars, you also earn a bit more pride in yourself. That is a powerful thing. Here's to USA Football. Earn your stars. Newer PostLovePrints. My name. My father. My family. My life. Older PostLovePrints. Unity Day. Hugs can cover the world in love.